Carnegie Mellon University researchers have found ways to track body movements and detect shape changes using arrays of RFID tags. RFID-embedded clothing thus could be used to control avatars in video games — much like in the movie "Ready Player One." Or embedded clothing could to tell you when you should sit up straight — much like your mother. What's new is the method that Jin and his colleagues devised for tracking the tags, and thus monitoring movements and shapes. RFID tags reflect certain radio frequencies. It would be possible — but not practical — to use multiple antennas to track this backscatter and triangulate the locations of the tags. Rather, the CMU researchers showed they could use a single, mobile antenna to monitor an array of tags without any prior calibration. Just how this works varies based on whether the tags are being used to track the body's skeletal positions or to track changes in shape. For body movement tracking, arrays of RFID tags are positioned on either side of the knee, elbow or other joints. By keeping track of the ever-so-slight differences in when the backscattered radio signals from each tag reach the antenna, it's possible to calculate the angle of bend in a joint. RFID-embedded clothes might be an alternative to wrist-worn devices, such as Fitbit, for activity tracking or sports training. RF-Wear technology developed at Carnegie Mellon University calculates skeletal motion by analyzing radio signals reflected by RFID tags positioned on either side of each joint. The technology for monitoring changes in curves or shapes, called WiSh for Wireless Shape-aware world, also uses arrays of RFIDs and a single antenna, but relies on a more sophisticated algorithm for interpreting the backscattered signals to infer the shape of a surface. WiSH was presented earlier this year at Mobisys, the International Conference on Mobile Systems, Applications, and Services, in Munich, by Jin and Jingxian Wang, a Ph.D. student in CMU's Electrical and Computer Engineering (ECE) Department. It could be incorporated into smart fabrics and used to track a user's posture. It also could be incorporated into a variety of objects. "We can turn any soft surface in the environment into a touch screen," Wang said. Smart carpets, for instance, could detect the presence and locations of people or used to control games or devices. 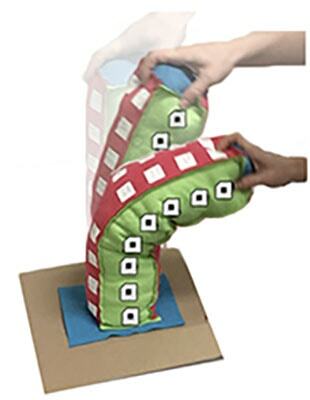 Soft toys could respond to or otherwise register squeezes and bends. Smart pillows might help track sleep quality.